In the overwhelming majority of homeschool families, the children's education is Mom's job. Of course there are some fathers who teach their children, but do dads whose wives are primarily responsible for educating the children play any role at all in the process? We asked some homeschool dads to share what they do to support their children's home education. Here are the top five responses. 1. Most of the fathers surveyed mentioned financial considerations. All were the primary wage earners for their family, which allowed Mom to stay home and teach the children. One dad said he supported his wife's efforts by agreeing to buy additional curriculum without fully understanding the necessity of the purchase himself. 2. All of the dads considered themselves cheerleaders. They applauded their wive's efforts and took an interest in the kids' school work. One family had a sort of show-and-tell before dinner every evening, with the children sharing their favorite school projects with their father. 3. Several of the husbands were sensitive to their wife's need for an occasional break. One routinely takes the kids on an outing for a couple of hours on Saturday, so Mom gets a little time for herself. Several have instituted weekly date nights with their spouses. 4. A couple of the fathers were responsible for teaching one or more subjects themselves. One dad is a math whiz, so the children save this subject until after dinner, when their father is able to tutor them. Another has a special interest in science and has chosen to share his pet projects with his kids. 5. All of the dads mentioned the various ways they incorporate educational activities into daily interactions with their children. Bedtime stories, board games, sports, and field trips to support thematic unit studies are popular ways for fathers to enjoy spending time with their families. What role does Dad play in your homeschool? I don't know about you, but I feel as though I wake up, my feet hit the ground and I am going, going, going until I fall into bed at night. Life is WONDERFUL and I wouldn't change one single thing, but it's fast paced and goes by too quickly. Anyone else ever feel this way? (understanding smile) We blink and our children are all grown up. I don't want to miss one moment. I remember a few years ago there was a big movement that had psychologists saying that "quality" was better than "quantity" time. As a mom of four children 1st through 12th grade I've come to find that they need BOTH! I have found that it's easy to take for granted one or the other. Because I am home all the time I can pacify myself with the fact that my children get to be with my all the time. (Quantity Time) But then If all they see is the back of my head while I spend time on the computer what good is that? On the other hand, when I worked full time I remember scheduling a Chuckee Cheese date or park day (Quality Time) with the kids and after we'd get home I'd let them watch television while mom caught up on the laundry, chores and grocery shopping. It's so easy to lean one way or the other. However, I really want to get it right because what I do today is the memories they will have tomorrow. I have to be very purposeful about my "Quality" time. It is so easy to take for granted my little ones gathered around during the day. If not careful I can let them do school and play with one another while I spend all my time on the phone or computer. Now there is nothing wrong with computer or phone time in balance, but in excess all they'll remember is the back of mama's head. I want to take time to sit and watch shows or play games with them. 1) Reading one chapter a day out of a good book with my kids snuggled up next to me. 2) Working one-on-one with one child while the others are working on their Time4learning lessons. 3) Doing a mini unit study on something we've learned from Time4Learning or a book we've read. 3- Sitting around the dinner table at night no matter how much easier it would be to sit around the t.v. or at a bar. 4- Picking one night a week for game night and another for a movie night. 5- Choosing one day to go to the park just as a family. How about you? Do you tend to be stronger in Quality or Quantity time and what helps you find balance? When my boys were in the early elementary years, I had homeschooling fantasies of reading great books together from morning till night. Hey, if I had been homeschooled as a kid, it’s what I would have liked! And although I quickly learned that boys aren’t going to put up with sitting cozied up on the couch together for 12 hours a day, I found that they still got a lot from our adventures in literature. We began, where many homeschoolers do, with a jaunt through Five in a Row. How can you go wrong with classic children’s books and activities that make them come alive?? After that, we experimented with Sonlight, and picked and chose our favorite parts of the curriculum to customize a learning plan for each child. By the time they hit middle school, though, my boys were definitely feeling the lure of technology. Those years of patiently putting up with mom and her book-addiction were over, and they wanted something they could interact with - - something multimedia – something less…well…bookish. When my youngest began his first year with Time4Learning™, I sadly shelved our collection of must-reads, and watched with dismay as the flashing lights and bright colors held him captive. But not one week into this new curriculum, he hit upon his first assignment based on a book excerpt. The assignment was called “My Brooklyn Grandmother”, and gave students insight into the life of Chinese Americans. He interacted with the reading, got his multimedia fix, and then can you guess what my son asked soon thereafter? That’s right…he wanted to read the REST of the book. So off we went to the library in search of the full autobiography, “The Lost Garden” by Lawrence Yepp. I kept my Cheshire cat grin safely hidden behind the spine of our newly checked out book, and drove home, quickly - - anxious to get back to that couch again and start reading! What about you? How do you fit books and reading in with your current homeschool curriculum? What kind of support is there for parents who have decided to homeschool, or have begun the decision-making process? The Time4Learning Parent Forum has been a great place to interact with other homeschool parents. Benefit from the opinions of experienced homeschoolers. Find a listening ear or a shoulder to cry on. Locate families in your area, compare curriculum, and trade parenting advice. While you're there, share a recipe or craft idea. To meet the needs of its members, the forum has expanded to become the Time4Learning Parent Community, a rich source of resources for homeschooling. The Home page includes informative articles about topics of interest to homeschoolers, and the ability for members to comment on what they have read. Be the first to comment or join an already active discussion. Do you have a special interest? Join or start a social group to connect with like-minded people. 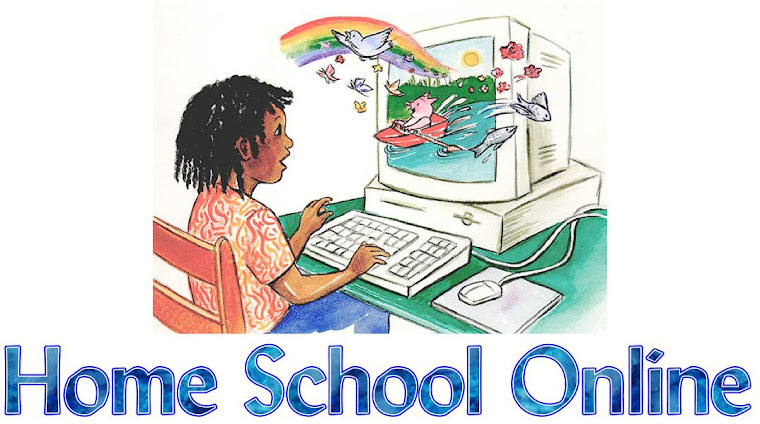 Topics can be many and varied and do not have to specifically deal with homeschooling. Have you considered starting a blog? The Time4Learning Parent Community is a great place to easily get started! If you're already a blogger, maybe you have considered started a second, themed blog. In addition to the new features, parents in the Community now have the ability to start a home page, maintain their own photo gallery, and "friend" other members. To allow members to get to know each other better, one regularly posting member is highlighted each month. Look for fun contests, like the current January raffle, where members have the opportunity to win a free, three-month subscription to the Time4Learning on line homeschool curriculum. What else would you like to see in the new community? Please comment with your ideas for additional features, games, or activities. Thank you for being a part of our community, and don't forget to take advantage of all of the new capabilities! One of my favorite articles from month's ago was written by my sweet friend Kerry. Her article was entitled, "Where In The World Are You"? She asked each of us to identify where we lived using the Time4Learning Parents Map. It had a great response and we had so much fun getting to know each other. Have you checked out your states forum? This is a great place to find out about your state laws, activities, support groups and more! You can even share field trip idea's! 1- What STATE are you from? 2- Do you consider your state homeschool friendly? The uninformed sometimes assume parents can't effectively teach their children at home. My teen enjoys wearing a tee shirt designed to poke fun at this impression. It reads, "I Are Homeskooled". If we have friends or relatives who are concerned our homeschooled children will grow up poorly educated and lacking in social skills, we've probably armed ourselves with some statistics designed to quell their fears. Homeschoolers' standardized test scores average twenty or thirty percent higher than students in public school. In states where homeschooled students register with the school district, 25% of homeschoolers are enrolled one or more grades above their age level. Students taught at home read earlier and more regularly. They attend college classes during their high school years. They excel in geography. They win spelling bees. But what if YOUR child isn't doing any of those things? We may have armed ourselves too well! By using exceptional students as examples to defend our decision to home educate, we often set up unrealistic expectations. Now there's something "wrong" with our child if he is simply average. Mothers, especially, may feel pressured to produce super kids. The decision to homeschool usually follows a period of concentrated focus on the needs of the child. It's only AFTER home instruction begins that the teaching parent realizes their OWN performance is now being scrutinized by critical family and friends. "I feel as though I'm under a microscope," one mom confessed. "My family reads about homeschoolers who excel and they expect me to produce the same results with my son!" One dad stepped up and declared his children's academic performance off-limits during get-togethers with extended family. "My kids were held to such high standards!" he explained. "No, they haven't won any contests lately . . . but we've more than satisfied all the requirements for homeschooling in Oregon. Why isn't that good enough?" The baby in the picture is my son. 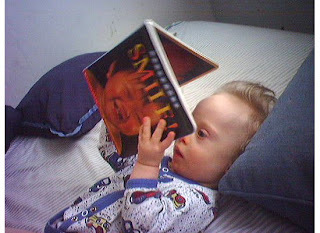 I snapped that shot because it looked like he was reading at nine months, despite his special needs. "Look what homeschooling can do!" I joked. I no longer try to promote those high expectations. Enter the spelling bees, if your student is interested. But feel equally free to decline. Ignore those who expect homeschooling to produce near-genius results. It's only fair to expect our kids to do their best.